The Ministry of Energy and Coal Industry of Ukraine and China National Nuclear Corporation (CNNC) have discussed organization of nuclear fuel production in Ukraine, the press service of the ministry has said. The corresponding issue was raised during the meeting of Deputy Energy Minister of Ukraine Natalia Boiko and the CNNC President on October 26. 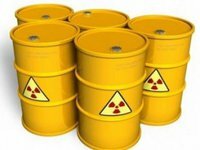 "The parties discussed the expansion of cooperation in the development of the nuclear industry of Ukraine and China, organization of nuclear fuel production and the joint implementation of an investment project on the basis of a newly constructed mine at Novokostiantynivske uranium ore deposit," the report said. The parties also discussed the issue of involving China Development Bank (CDB) in financing the project of Novokostiantynivske uranium ore deposit. As reported, Minister of Energy and Coal Industry of Ukraine Ihor Nasalyk stated about the interest of Westinghouse and one of French companies in building a plant for producing nuclear fuel in Ukraine.